Tokyo Electric on Friday said it had spotted what is almost certainly fuel debris in reactor 2 at the Fukushima No. 1 plant that shows its fuel assembly likely dropped through the pressure vessel. 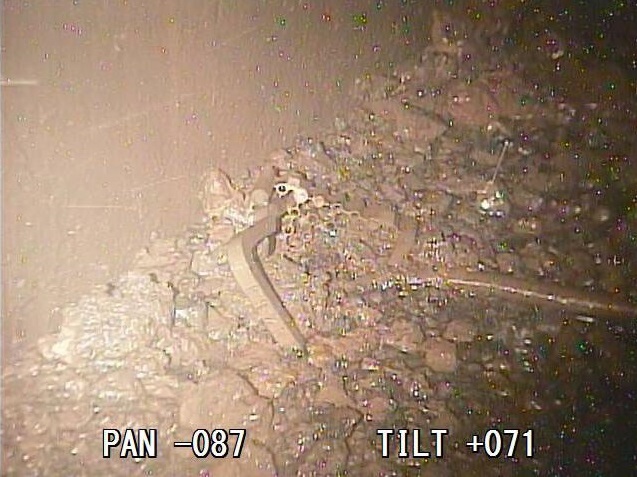 While Tokyo Electric Power Company Holdings Inc. got a peek at lava-like objects that looked like melted fuel in reactor 3 last year, this is the first time it has located similar debris in reactor 2. 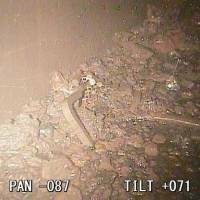 Tepco inserted a 13-meter pipe-shaped device with two cameras on its tip into a 12-cm utility hole in the primary containment vessel to capture images of the area directly beneath the pressure vessel, which holds the core. One camera spotted a handle for the fuel rod assembly lying at the bottom of the PCV, surrounded by sediment. 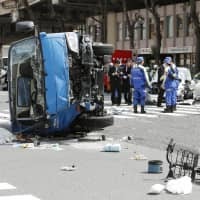 This means “there must have been a hole big enough to let the fuel rod assembly fall out of the reactor, so we are almost certain that the sediment around it is fuel debris,” Tepco spokesman Takahiro Kimoto explained at a news conference at the utility’s headquarters in Chiyoda Ward. Kimoto also said the image shows pebble-like objects that look similar to the fuel debris witnessed at the Three Mile Island facility in Pennsylvania after its partial core meltdown in 1979. The fuel melted after the mega-quake and tsunami of March 11, 2011, knocked out all power to the Fukushima No. 1 plant, crippling its vital cooling systems. As a result, some of reactor 2’s fuel rods apparently melted and penetrated the bottom of the 20-cm-thick pressure vessel before dropping to the bottom of the PCV. Locating the fuel debris is crucial to decommissioning the crippled plant, which is expected to take more than three decades. Tepco plans to decide on a plan for removing the fuel in fiscal 2019. This is the first internal probe of reactor 2’s primary containment vessel since February last year, when it inserted a rod about 10 meters long to capture images of the interior. At that time, Tepco found some black sediment stuck to the steel grating beneath the pressure vessel but could not tell what it was. Last July, the utility sent a robot inside reactor 3’s PCV, where it found what was believed to be melted fuel debris.